I have been working on v2 of the LeafCAN firmware, which adds a whole slew of new screens, selectable via a rotary encoder. The rotary encoder is connected to the AD0/1/2 pins on the expansion header of the LeafCAN V2 hardware. The code is currently in alpha testing, and is available in the development branch of the LeafCAN github repository. Be aware that the development branch is for my bleeding edge code, and at any time, the code there may be broken, as I continually checkpoint my code. I will move it to the master branch when it’s ready to be released. but I am still pondering how best to use it. Currently, I have it blue when the car is idle, red when it’s consuming power, and green during regen. Thanks to a breakthrough in active can sampling, spearheaded by GregH and TickTock, I was able to implement the following new screens. The first one has on the top line, High Precision State of Charge (SOC)%. The bottom line shows State of Charge (Ah), and possibly a Battery Health %. When an OLED is installed, the display now blanks after 5 sec of inactivity on the CAN bus. Pressing and holding the knob for a second wakes the display up for 5 sec. When an LCD is installed, the press/hold turns on the backlight for 5 sec, instead. 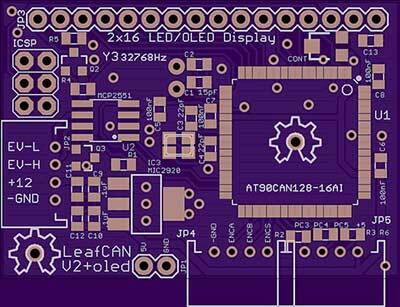 I will be working towards finishing LeafCAN v2.0 in the coming weeks, and will announce its release here. Barbouri and I are also collaborating on a dual-CAN bus version of the LeafCAN hardware, which will be able to monitor the Car-CAN as well as the EV-CAN on the Nissan Leaf. This will open up access to various information which is accessible only via the Car-CAN, such as friction brake actuation, steering angle, etc. 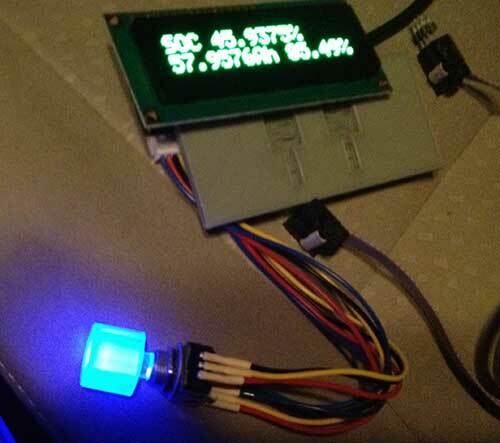 I would also like to point out that GregH has yet another cool Leaf CAN bus dash display in the works (only $80) that is worth checking out. Also, TickTock and garygid are working on the very fancy dual-touchscreen open-source CANary Project. Turbo3 has also figured out how to extract data from the Leaf Car-CAN using a cheap ELM-327 clone dongle and an Android phone. There is currently a flurry of CAN bus hacking on the Leaf. There are 6 Comments to "LeafCAN v2 Firmware in Alpha Test"
Do you know how to read VIN, speed, and charger volts and amps for the Leaf? I have some other info from GaryG. Working on iPhone and Bluetooth project to look at CAR and EV bus to do carbon comps to other EVs and std vehicles. Unfortunately, not. Almost all of the messages I’m aware of are in the LeafCAN code. CANary attempts to make calc speed and distance from the “motor RPM” number, but I don’t know how accurate it is. Have you made any revisions to the project to replace the “possibly a battery health%” number with the actual SOH%, as discovered by TickTock here? Sorry, I’ve been out of the loop for a while. What is SOH%? I tried searching the forum and couldn’t figure it out. Did you try my link to TickTock’s post in the MNL forum? SOH is located at 5b3:D2 and appears to be an accurate measure of battery capacity (as a percentage of new.) Also, multiplying a constant for new battery capacity by SOH and SOC would give a better, higher resolution measure of the kWh in the pack than using GIDs. I want to start student project which is about extracting CAN data in Nissan leaf and monitoring on smartphone , but I’m confused, there are a lot of ARM microcontroller available where I dont know which one is useful.Would you please help me to find a best way? ?